Escape from the Planet of the Apes was the second film of the Planet of the Apes series that I saw as a kid. It was shown at 6pm on a weekday evening on BBC2, which was when all the great old films were shown, films with dinosaurs and zeppelins and cowboys and Great White Whales and apes, especially apes. I've always liked apes. And aged 17 – I just checked BBC Genome, it was February 1993, a Tuesday – I was initially disappointed because dammit I was hoping for another film with, you know, a planet, with a load of apes on it. And there's only three apes that count. Look, I'm not proud of that. Your tastes are different when you're a teenager. But I watched it, enthralled, anyway. And let’s put it out there. I love this film. Apart from the original, out of four sequels, three prequels, two TV shows and one godawful inthemiddlequel, Escape from the Planet of the Apes is still my favourite. I think it's the best, the most thoughtful of the sequels, and the one that works best as a counterpoint to the original movie. The three apes include of course Cornelius (Roddy McDowall once more), Zira (Kim Hunter) and with them comes ape scientist Dr Milo (Sal Mineo), the last of whom is credited with having recovered George Taylor’s spaceship and with somehow getting it working. Yes, it’s ever so slightly far-fetched, given the apes didn’t think that powered flight was even possible, but all the pieces were there: two spaceships, waiting to be found (and probably with enough bits in them to make one complete ship), chimp-led expeditions into the Forbidden Zone, and chimps with scientific curiosity and boundless smarts. Screenwriter Paul Dehn simply reasoned that it was possible that an ape scientist we hadn’t met before might have been working on the ships before the nuclear holocaust happened, and that Zira and Cornelius might have gotten on board… and look, what could Dehn do? They went to him and said, more or less, OK, write us another Planet of the Apes film, and we’ve got another budget cut, off you go, and he took the genius step of not only inverting the story, but laying the ground for a new story to begin. 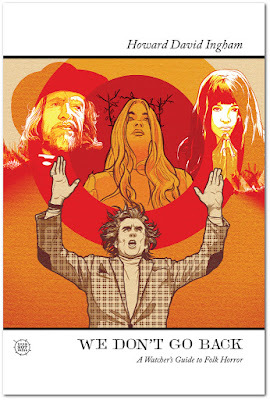 Not only did Dehn solve the problem of how to continue the Planet of the Apes series, but he enabled it to start again, and as we’ll see eventually, Escape from the Planet of the Apes begins a new trilogy of films that will set up and tell that second, more interesting story we mentioned last time. From here on in, we’re not watching humans in a world of apes, we’re watching apes in a world of humans who will, by their very presence, begin its transformation into a world of apes. Apes are our protagonists; apes are our point of view. We are seeing human society from the outside. I think we need some air. The apes wind up in quarantine at the zoo, examined by a couple of friendly vets, Lewis Dixon (Bradford Dillman, who sadly only passed away the other week) and Stevie Branton (the species-hopping Natalie Trundy). For a while, the three apes are wise enough to speak no evil (or anything else for that matter) but Zira’s growing impatience with the behavioural experiments leads to a charming scene where they're supposed to build a staircase out of coloured blocks to reach a banana. Zira, adopting an oh-for-heaven’s-sake demeanour, builds the thing and then sits on top of it, staring at the fruit. Dr. Branton: Well, why doesn't she take it? Zira: Because I loathe bananas! And as the vets flail about, stunned, and step out for air, the three apes argue about the wisdom of Zira’s outburst, and then the gorilla in the next cage strangles Milo to death. And it's entirely that sudden. And part of the reason, even though it's only about 15 minutes in, that this is the most pivotal scene in the film is that it has a sort of programmatic effect. 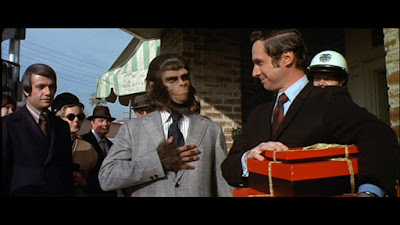 Escape from the Planet of the Apes is absolutely the funniest of the Planet of the Apes films; entire sequences are straight comedy, delightful, gentle things, wholly played for laughs. But the comedy is undercut by violence and death. After the comedy comes a sharp swerve into the dark, every time, and the aftermath of the banana scene is there to warn you not to get too cosy. Of course it's also an inversion of Taylor’s line, the one that drives the apes to distraction because everyone sees he can talk and the secret is uncorked. Does the other one talk? Only when she lets me. While “Take your stinking paws off me, you damn dirty ape!” is significantly more operatic, Shakespearean even (as in, it's almost iambic pentameter), “Because I loathe bananas!” serves a similar purpose. It has none of the machismo of Taylor’s iconic line, it expresses petulance and frustration rather than grandiose rage, but it nonetheless is an assertion that the speaker is not an animal. Chimps love bananas. But sentient beings choose what to like and what not to like. But as a matter-of-fact statement, and a funny one, that denies its speaker the status of animal, it's not the bomb that heralds in the second act. No, that's the gorilla strangling poor Milo. That's the violence that follows the comedy. 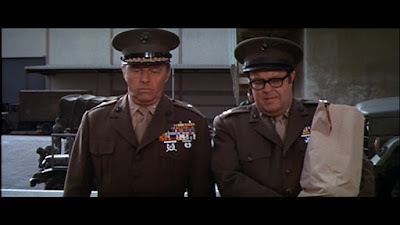 General Winthrop: You called the zoo? Gregg: Yes, sir. We’re in luck. Sickbay’s almost empty apart from a mauled foxcub, a deer with pneumonia, and a depressed gorilla. Look, that’s a comic line. That’s not a line from a piece of brutal drama. And that lighter tone works both ways: it makes it in a lot of ways a, brighter, easier watch, and yet when the hammer drops, it drops all the harder. Take the Presidential Hearing scene. Again, although there's much to laugh at (“Does the other one talk?” “Only when she lets me.”) it's undercut by the presence of Dr. Hasslein (Eric Braeden). This is the same Dr. Hasslein who predicted the effects of the timewarp, and who was namechecked in both the previous films. Here he's the President's scientific advisor, and incidentally doesn't that feel vintage, having a fictional president who listens to scientists? 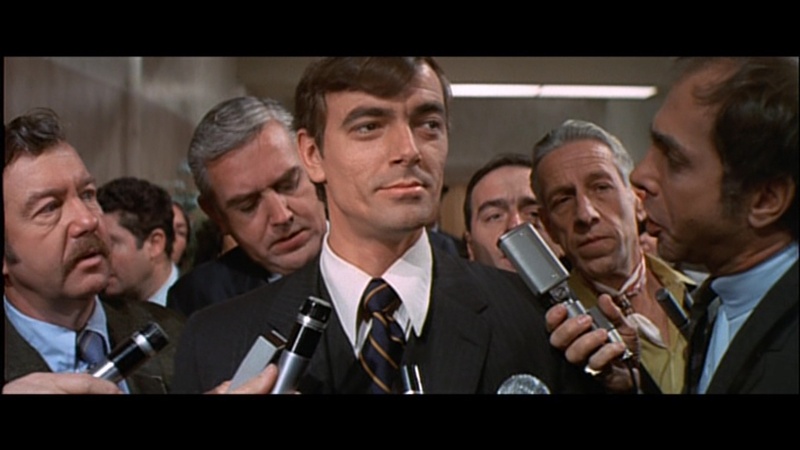 Hasslein’s first appearance in the flesh sets the tone for him. Reporter: As the President's senior scientific advisor, what do you think you'll take away from this historic meeting? And fear is what he's about, what drives him. Although cold, seemingly callous, Hasslein is afraid. And it's Hasslein who signifies the dark. He's the Doctor Zaius of his milieu, the one who knows the truth and is afraid of it. And this is the big parallel between Escape from the Planet of the Apes and that original film: it's not knowing the truth that defines one's actions, it's whether you're afraid of it. 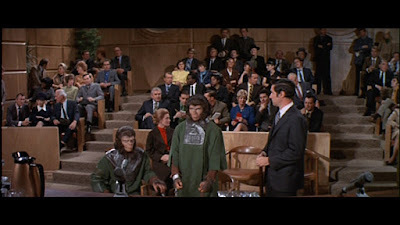 Hasslein picks up on the inconvenient truths of Zira and Cornelius’s statements at the hearing. Hasslein urges that the future they threaten be prevented. 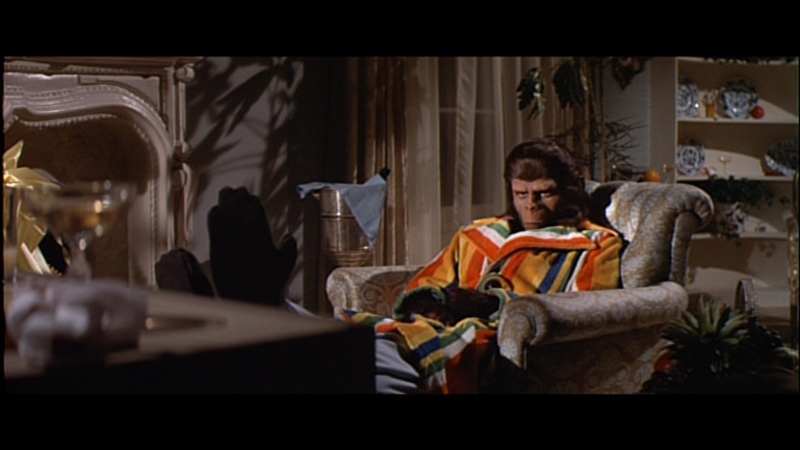 And, consequently, Hasslein is the prime mover of the horror that meets Cornelius and Zira head-on. But that comes later. 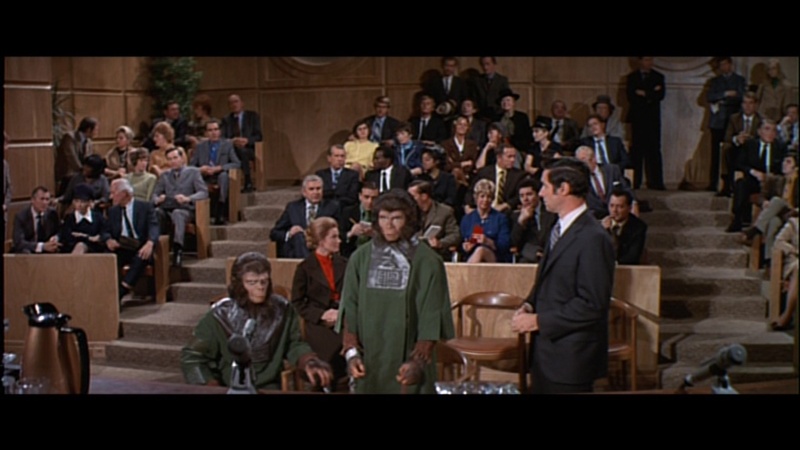 Having charmed everyone else present at the hearing, the chimps enter the public sphere and become celebrities, and there's a lovely, bonkers series of scenes where they become media celebrities, and this is what happens to Ulysse Mérou in the original novel, and the danger that ends the apes’ giddy enjoyment of their state is the same as that faced by Mérou. For Zira is pregnant. A pair of smart, talking apes are a fun media attraction. A pair of smart talking apes who can breed threaten – well, let's face it, they threaten a planet of the apes. Hasslein manoeuvres the apes into the way of tragedy. The apes face Zira’s baby being aborted and surgery to prevent them ever having any more children. 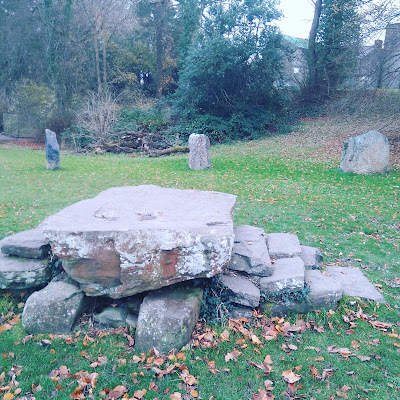 They escape, but someone dies in their way. Now they're a public menace. 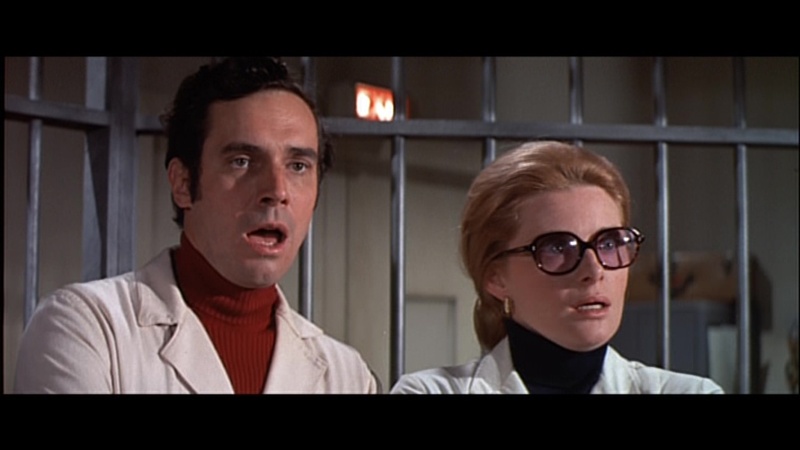 The good Doctors Hasslein and Zaius are not bad guys. They're worse. They're principled people who do bad things because they want to protect their worlds. Both in their own way fail catastrophically. It's interesting how critical science fiction of the 70s is of the American government, and just how much that has changed. Here though, the government are just various shades of incompetent. They're none of them bad people, and in fact the film goes out of its way to suggest that they're pretty decent.Hasslein spends quite a lot of screen time, more than you think, arguing the ethics of what he's doing. Although callous and manipulative – witness him getting Zira drunk and secretly recording her tell him the truth about the future – everything he does comes from a sense of urgency, of fear that something terrible will come to pass. And while, quite reasonably, the President and others tell him that none of this will happen at any time in their lifetimes and might never actually happen, this is irrelevant to Hasslein, because Hasslein is a man who believes in a greater good. He believes in the human race. It doesn't matter to him that he won't be there to see the human race saved, because only saving it matters. President: Now what do you expect me, and the United Nations – though not necessarily in that order – to do about it? Alter what you believe to be the course of the future by slaughtering two innocents, or rather three, now that one of them is pregnant? Herod tried that, and Christ survived. Hasslein: Mr. President, Herod lacked our facilities. Dr. Hasslein has an understandable motivation, but the very clear-eyed view of Dehn’s script is that a bunch of psychopaths and a bunch of decent but terrified people, if put in charge of the same authority, amount to the same thing and go in the same direction. Now Zira and Cornelius are in danger. Dixon and Branton take on the roles Cornelius and Zira once took, helping the protagonists to go on the run and risking everything with it. But Zira is about to go into labour. And here the parallels end. Because here is where Armando comes in. It's like a baby born on the moon. Armando: You're asking me to risk imprisonment for the sake of two fugitive apes? The answer is a thousand times yes! 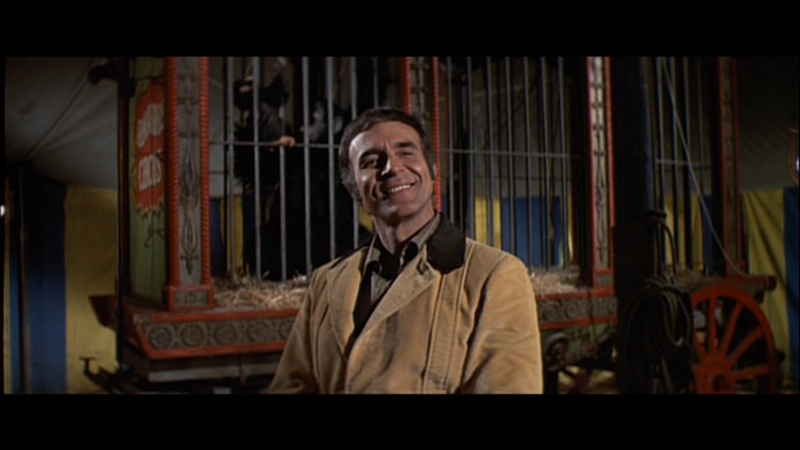 Armando (the peerlessly charming Ricardo Montalban) runs a circus, and he is devoted to the animals, and he's the kind of mirror to Hasslein that Zaius never had, Because like Hasslein, Armando knows the truth, and knows the full extent of the threat, but unlike Hasslein, he would take a more compassionate course. Hasslein and Armando both have a selfless devotion to humanity; but while Hasslein is devoted to humanity's survival as a going concern, Armando's devotion is to humanity as a spiritual ideal. Materialist selflessness and spitirual selflessness stands opposed. He's with the apes from minute one. He's a free thinker, a traveller, an intensely compassionate, romantic and spiritual figure, and hell, he's Ricardo Montalban, of course he's a romantic figure. And OK, he's the romantic stereotype of the compassionate circus owner, and let us be honest here, that's not necessarily a realistic depiction. But as a man who understands fate and who combines his love of his animals with a profound religious faith, Armando is perfectly placed here, and in the subsequent film, as an agent of a different sort of future. Anyway, Armando has chimps, including one who has just given birth, and there's a scene where Zira and Cornelius meet the chimp and her baby, and Zira tries to get the kid to say “mama”, which is futile. Armando helps deliver Zira’s baby, whom they call Milo, and helps them to escape. But they don't escape. 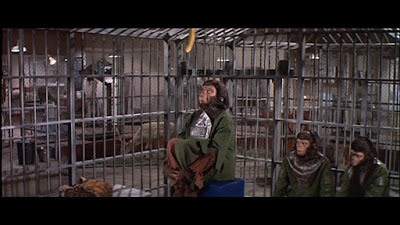 The final scenes of Escape from the Planet of the Apes are harrowing. Run to ground on the docks, a gun battle ensues. 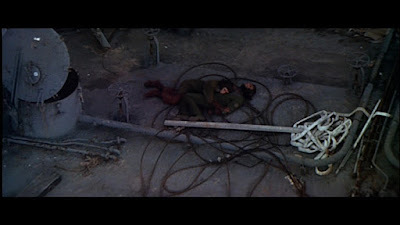 Hasslein dies, but so do Cornelius and Zira, and there's a heartbreaking, awful moment, where Zira throws her bullet-ridden baby’s corpse into the sea rather than let the military get him. And that's genuinely shocking, and more so after cuddly fairytale circus owners, and hijinks with bananas and interviews and apes in pyjamas. Ape infanticide ends the film. Except that once more, we meet a twist. For in a coda, we see that as the baby chimp in Armando’s circus grows,he begins to talk. Zira, switched the babies and Armando either knew along or soon realises and decides to hide the truth. Either way, the future is here. 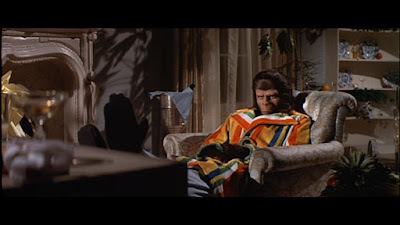 Zira and Cornelius only escaped from the Planet of the Apes inasmuch as they escaped its destruction, but their escape is temporary; the planet they wind up on is the potential Planet of the Apes, and as such, they don't really go anywhere. And although Dr. Hasslein tries his best, he can't prevent the Planet of the Apes from happening. Not only do Zira, Cornelius and poor Milo not escape from the Planet of the Apes, the entire human race can't escape it. There is literally no escape from the Planet of the Apes. And that means that now we can tell the second, more interesting of our two stories in earnest. 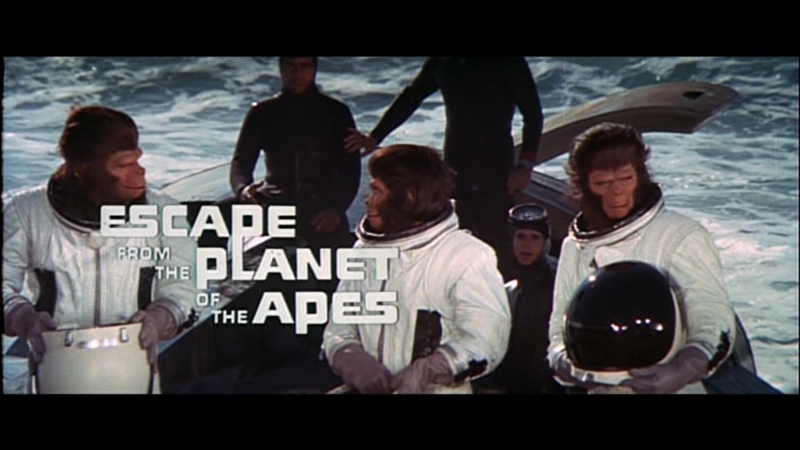 Because now the Planet of the Apes is literally inescapable, we can talk about how it comes to be. If you liked this, I've got an account on Patreon. No donation is too small. Re: Arrival - I don't know if that's fair. After all, it is American soldiers who actually kill a heptapod, due entirely to fearmongering American tv personalities, and while the Russian and Chinese governments may be a bit more open about their desire to control any discoveries, its not like the American camp is livestreaming their coversations. I would say more that the US military/intelligence community is depicted as more politically stable but split, leading to a lack of oversight and control, while the Chinese military/intelligence community in what we can see is more often united under strongman figures (General Shang) but that that status is more vulnerable. The Americans almost shoot their own scientists too - its only a bit of a temporal loop and a sealed airlock door that saves Louise.